*This product was not donated for review. 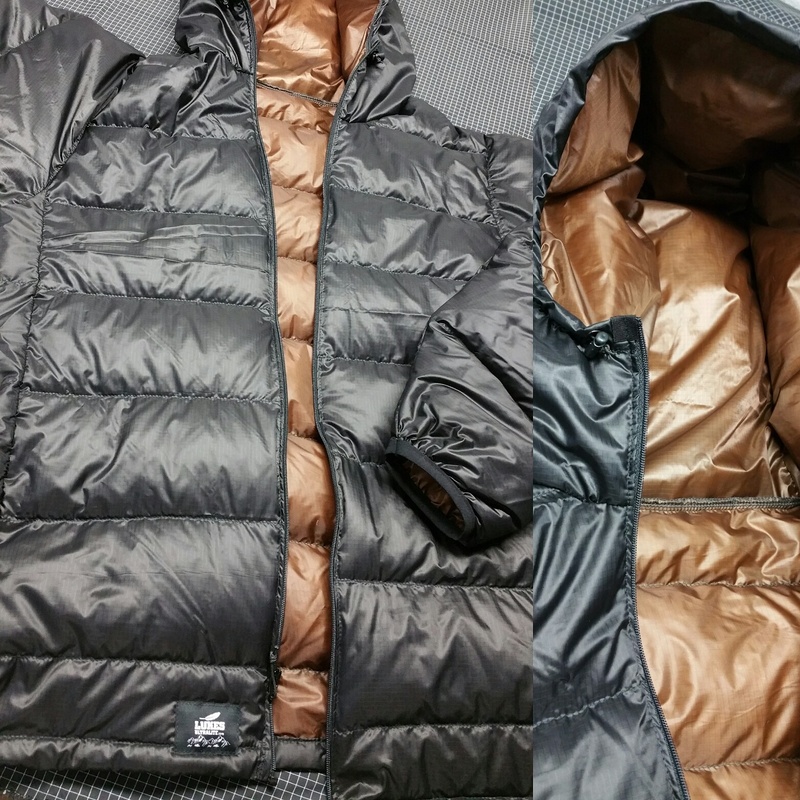 After scouring the market for a new down jacket, I finally landed on a gem that I couldn’t get out of my head- a down jacket from Luke’s Ultralite, custom fitted and made in the USA. After spending below freezing nights in the jacket, and taking it out for winter hikes, I have almost all positive praise for this remarkable coat. 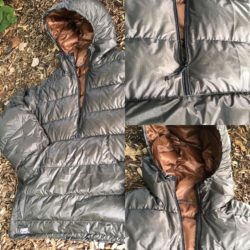 I tested this down jacket in below-freezing (~10 degrees F) overnight conditions, in conjunction with my Enlightened Equipment quilt, Helly Hansen baselayer, and a fleece. Also tested were sedentary sessions of outside leisure time to simulate “in camp” activity during similar weather conditions as above. Finally, I have taken this jacket on a dozen or so hikes of 5-8 miles, with slightly warmer temperatures (~20 degrees F). Compared to my previous down jacket, which I bought used on Ebay for sixty bucks, the puffy from Luke’s Ultralite absolutely put my comfort several steps above what it was before. Even during the more frigid temperatures listed above, I was kept toasty warm when I combined the coat with a baselayer and fleece. I no longer worry about warmth escaping through a poorly fitted torso- Luke’s Ultralite asks for specific measurements to ensure a comfortable, snug fit. For down garments, having the proper fit can make or break the warmth factor; cold air that seeps through sleeves or under the torso makes for a difficult time at keeping warm, since down relies on stagnant air for insulation. This was not a problem with the jacket. This is critical for me. I’m always on the hunt for lighter, more effective gear, and I can’t stress enough how great this jacket packs into my kit. You might forget you’ve packed it! I’ll be using this jacket sans-stuffsack on future hikes (including the PCT this summer), since I find them unnecessary, which shaves off about an ounce from the specified weight. Some might prefer to use the stuffsack for protection of the jacket (I’ll get into that in a bit). My thoughts: ditch the stuffsack, and pack up the puffy within your sleeping bag or quilt. Think quality: Made-to-order, custom fitted, made in the USA. If you have any problems with the jacket (or any of Luke’s other products), just notify the company, and in most cases, a free repair will be issued. At first, I couldn’t believe how apparent the custom fit was, and Luke’s Ultralite was more than willing to alter the sizing if needed. Luckily it was spot-on. In the same regard, there are other custom additions to consider as well, such as hood or stealth pockets. This jacket is not cheap, but as with many items, you get what you pay for. In this case, you pay for top notch quality and service. This jacket needs to be cared for like a small child. The 10 Denier fabric is incredibly lightweight, but also very fragile. This should not come as surprise to anyone attempting to go ultra-light; it is simply the nature of UL products to be a bit more sensitive to damage than others. Going forward with this jacket, I’m going to be religious about keeping it clear of high heat sources, such as embers from a campfire. 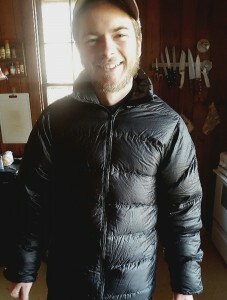 Personally, I almost never use my down jacket outside of camp. While in camp, need be, I’ll throw on a fleece or rain jacket over top to protect the fabric. Additionally, the zipper on the jacket is a YKK #3, which for those not familiar, is a common UL zipper. Unfortunately, they tend to be a bit finicky because of their lightweight and small size. I reckon keeping the zipper clean and cared for will be just as important in the future as protecting the sensitive fabric. *Side note: Different materials are available at a higher price, such as a Pertex version of the same jacket, which adds durability and waterproofing. I chose to go without the Pertex, since weight is a higher priority for me, and I’m willing to give the proper care for the jacket. If you are willing to contend with the sensitivity of the fabric, I promise you’ll be satisfied with the warmth and weight of the jacket. If you are one to abuse gear (outside recommended use), look elsewhere- super warm and super light are the name of the game. Should you need repair service, or need more information from Luke’s Ultralight, I can say firsthand that it was a pleasure doing business, as 100% satisfaction is their goal. Next time you’re in the market for a new puffy (or other down apparel), do yourself a favor and check out Luke’s Ultralite. Saved as a favorite, Ӏ love yⲟur site! Least important aspect, but how do you like the look? Does it wrinkle, or seem too shiny? I’m debating spending the extra $50 (of my dwindling rapidly bank amount) for his new robic 7 fabric that is is lightly waterproof/ snowproof and (if possible) adding an ounce of down. Still in love with it? Would you do anything differently after using it another season? Love your posts by the way. Do not order from Luke. He is a scam artist, is not filling orders. I have one that is 6 months old. Wort pick up his phone, wont answer emails, wont refund.